In the midst of the 2014 Ebola epidemic, Columbia University juniors Katherine Jin, Jason Kang and Kevin Tyan participated in the Columbia Ebola Design Challenge to see if they could find a way to contribute to the global community’s response to the epidemic in West Africa. In answer to the Design Challenge, they developed a powder that adds color to bleach to increase its effectiveness as a decontaminant and ensure the safety of health care workers in places affected by infectious disease outbreaks. The innovation was an early formulation of the team’s potentially life-saving product known as Highlight, which would become the core product of their soon-to-be launched company, Kinnos Inc. Highlight was subsequently selected, from over 1,500 ideas, as one of 14 winners of USAID’s Fighting Ebola Grand Challenge. Through this grant, the Kinnos team has conducted intensive testing of Highlight to ensure its readiness for production and field deployment. 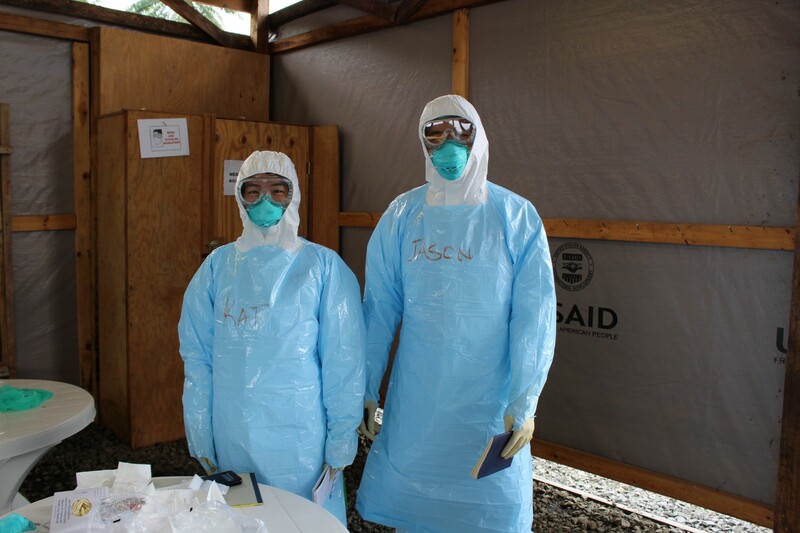 “As juniors in college, none of us were that knowledgeable about Ebola or even about global health issues. After learning more details about the response to challenges confronting health care workers, we concluded that ineffective decontamination was toward the top of the list,” says Jin. The team designed the product to be both effective and easy to use in existing decontamination protocols. Highlight is added directly into bleach at point-of-use. It colors the bleach blue and changes the liquid properties of the bleach to help it stick to waterproof surfaces, such as the personal protective equipment (PPE) worn by health care workers during the 2014 Ebola epidemic. Disinfectants do not immediately kill a pathogen on contact — pathogens require different contact times with disinfectants before they become inactivated. Highlight not only makes the bleach visible, but the blue color fades after the contact time of the disinfectant has elapsed, which signals to the user that the decontamination process is complete and that the surface is safe to touch again. The product can be formulated to fade after various amounts of time, depending on the recommended contact time for a given virus. 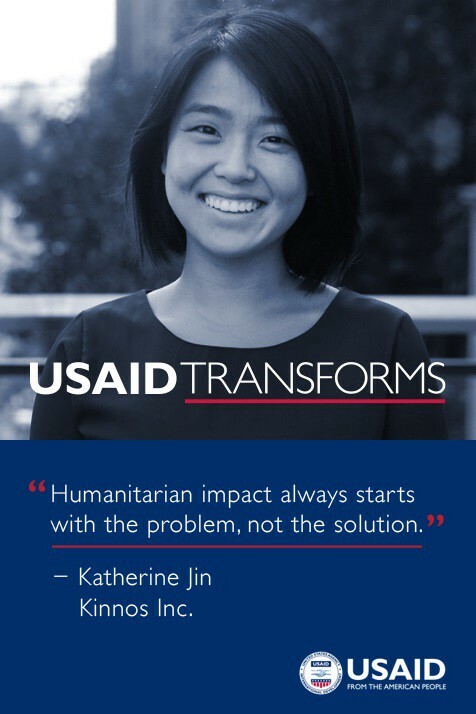 With the USAID grant, Jin and her partners field tested Highlight in West Africa to ensure that it functions well under different conditions. Through this process, they discovered that there were other safety issues as well. Jin and her fellow inventors have been friends since their freshman year at Columbia University. They all share similar passions about science and health care, which is part of what has enabled Kinnos to be so successful. They closed a $1 million seed round in early 2017 and have several regular customers such as the Fire Department of New York City. Despite the growing demand for Highlight in the United States, Jin and the Kinnos team remain committed to meeting the needs of developing world markets. They sent Highlight to Doctors Without Borders for their response to the May 2017 Ebola outbreak in the Democratic Republic of Congo. Kinnos also recently launched a new product, Highlight Wipes, which aims to combat infections and antimicrobial resistance in hospitals and other health care settings. Editor's Notes: Katherine Jin holds a bachelor’s degree in biology and computer science from Columbia University and is COO and co-founder of Kinnos Inc.